Ce courrier ne donne pas de nouvelles de Joey Lomangino. Dear Friends,Among Marian apparitions, Garabandal is distinguished by the ardor of the embrace of the Mother of God. It was customary for Our Lady of Mount Carmel to kiss the four young girls and to be kissed in return. Our Lady reverently venerated the sacramental objects offered to her by the visionaries on behalf of others; rosaries, holy medals, missals, and wedding rings. The girls in ecstasy had the uncanny ability to return the appropriate object directly to the owner not knowing beforehand who had presented which object.The final apparition on November 13, 1965 was expressly to kiss the accumulated articles to which Our Lady attached a solemn promise – for those who use these objects with faith, Jesus will perform prodigies. It is important to recall at the time of the Spanish Civil War, the Asturias, the region in which Garabandal is located, was a stronghold for the advance of Communism in Spain. The faithful of this region and the other adjacent northern areas were forbidden by law to own rosaries, medals and other symbols of Christianity. These objects, which had been passed down through the centuries in devout families, were hidden in those troubled times. Bearers who displayed religious items in public were ridiculed and assaulted or harassed by the authorities. For the apparitions, small tables were set out to accommodate these objects. A makeup compact was once laid down on one of the tables. This provoked an outcry against what seemed like a frivolous act, yet the small gold case remained in place. During the next visitation, Our Lady sited the compact and rejoiced, « This belongs to my Son. » Later it was revealed that the vessel had secretly conveyed consecrated hosts to those in hiding during the Civil War. 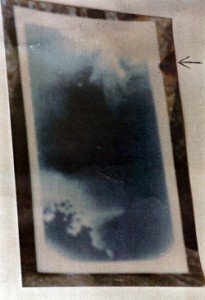 The apparition of August 6, 1962 is by contrast the only known occurrence of the Archangel Saint Michael embracing a physical object. And so on this day, fifty years ago, in San Sebastian de Garabandal, three Hospitaller Brothers of Saint John of God climbed the ox cart path that connected the remote mountain village to the outside world, arriving unnoticed in the sweltering midday heat. They did not know it, but they had come to receive a mysterious honor from the Prince of the Holy Angels. Born in Portugal in 1495, Joao Cidade Duarte abandoned his family as a small boy. He never returned. He tramped across Europe in violence and plunder as a thieving quartermaster in the imperial infantry. His service concluded, he returned to Iberia a forty year old prodigal with much to atone for. On the feast of Saint Sebastian, John went to hear a sermon by Saint John of Avila. He was so devastated with loathing for his sins that he turned on himself in fury and for a time sought a life of humiliation for Christ. He was cast into an asylum and cruelly beaten for days. It was John of Avila who came to absolve and release the man who would become John of God. Raised to holiness, John’s heart turned with compassion to his fellow incarcerates in the asylum. With a soldier’s knowledge of organization and field medicine, he began to shepherd the homeless, the abandoned, and the afflicted of Granada sheltering them and treating their wounds. He supported orphans, students, harlots, and the unemployed with his own labor, encumbering himself with their pecuniary debts, often suffering accusations and slandered by those he tried to help. After thirteen years in this way, he died a heroic and saintly death contracting pneumonia while attempting to rescue a drowning companion. He was found in death, kneeling before the crucifix, his face pressed to the wounded feet of Christ. Saint John of God left the world a small band of valiant hearts. The legends of the Order relate that often on the brink of collapse John of God was revived by the angels. Saint Raphael accompanied him on his rounds, healing and imparting the peace of God to the chaos. To this day the image of the Angelic Physician clothed in the habit of San Juan de Dios can be found in these hospitals. Murillo, on his canvas in the Prado, depicts Saint John of God as frail, struggling under the weight of the invalid he is carrying, menaced by the encircling dark. The saint is accompanied by a powerful archangel who strengthens him, illuminating his face and his path. Passing before the humble stone church of San Sebastian, the three religious came upon the young visionaries who told them, without affectation, of the wonders that were happening in the village and of the importance of the October 18 Message. The brothers rested under the nine pines of the apparition eating lunch and enjoying the discussion. Conchita accompanied them but she did not eat. She told them Mass had not been offered in the village that day and the Angel would bring her Holy Communion. Until he arrived she would remain fasting. Then the ecstasy took a decidedly different turn. Returning the Scapular to Brother Luis, Conchita repeated this gesture for the Scapulars of Brother Juan and Brother Miguel offering each one up reverently. With a concluding Sign of the Cross, the ecstasy ended and Conchita returned to normal with a shy smile. To this exterior sign was added an interior grace for Brother Juan. This leads one to wonder about the significance of this profound display of angelic predilection and solidarity. Conchita is quite clear in stating that the brothers themselves were pleasing to God.Considering over one thousand priests and religious attended the apparitions and there exists no other record of acknowledgment by Saint Michael, the singularity of the event appears to lend special importance. Brother Juan Bosco, in his notes, believed this reciprocated the high esteem given to Saint Raphael in their community. More generally, the gesture conveyed a salute for the work of the Brothers who in their ministry of attendance and healing and their love for the poorest, the most neglected and infirm reflect the virtues of the angels. Could there be some further explanation? On July 19, 1936, by decree of the radically secularist government, the Brothers Hospitallers of Saint John of God were declared enemies of the people of Spain. Ninety eight brothers were murdered in the Red Terror. The Soviet backed persecution of the Roman Catholic Church executed six thousand eight hundred thirty two religious, killed tens of thousands of lay faithful in odium fidei, and desecrated and destroyed over twenty thousand holy places. The sons of San Juan de Dios remained with their patients, faithful to the fourth vow of the Order never to abandon the sick except in death. They made no attempt to flee the coming violence. Seventy one brothers martyred between July 24 and December 14, 1936 were beatified by Blessed John Paul II including more than forty in Madrid and Barcelona who refused to leave the hospitals and were shot on site. Some were exultant at their execution, commending each other to imminent paradise.Their last words were of forgiveness, pardoning their murderers. All were steadfast. Could the martyrdom which preceded the apparitions by a quarter century have had an influence on the occurrence of August 6, 1962? It is a wonderful idea to contemplate. At this time, there exists no evidence directly linking the two. Perhaps in the days to come or with the definitive resolution of the Aviso and Great Miracle this extraordinary event may be more completely illuminated. As we share recollections of the events of fifty years ago we should honor this day, worthy of remembrance for the devotees of Our Lady of Mount Carmel de Garabandal. This day, the Angelic Patron of the Church of Jesus Christ venerated the Scapular of Saint John of God three separate times. A few small pieces of these same Scapulars kissed by Saint Michael were cast into relic medals in Spain in the 1970s. About 200 were given to the New York Center. To honor this anniversary, we would like to offer these medals gratis to our email list. We would like to give priority to religious and lay men and women who work with the sick and dedicated care givers to the handicapped – these requests should include a « + » in the email subject line. We want to emphasize that no supernatural promise has been made concerning these medals. We can offer one per request while the supply lasts. Please send an email with BESADO in the subject line to joey@garabandalny.org with your complete mailing address, country and postal code. Plus tard, il a été révélé que le poudrier avait secrètement transmis des hosties consacrées à ceux qui vivaient dans la clandestinité pendant la guerre civile. L’apparition de Août 6, 1962 est en revanche la seule occurrence connue de l’Archange Michel Saint embrassant un objet physique. Et si ce jour-là, il y a cinquante ans, à San Sebastian de Garabandal, trois Frères Hospitaliers de Saint Jean de Dieu a grimpé le chemin charrette à bœufs qui reliait le village de montagne isolé du monde extérieur, en arrivant inaperçu dans la chaleur torride. Ils ne le savais pas, mais qu’ils étaient venus pour recevoir un honneur mystérieuse du prince des Saints-Anges.+ + +Un croquis de la SaintNé au Portugal en 1495, Joao Cidade Duarte a abandonné sa famille comme un petit garçon. Il ne revint jamais. Il piétinait à travers l’Europe dans la violence et le pillage comme un voleur dans la quartier d’infanterie impériale. Son service terminé, il est retourné à une de quarante ans Iberia prodigue qui a beaucoup à expier.En la fête de Saint-Sébastien, John est allé entendre un sermon de Saint Jean d’Avila. Il était tellement dévasté avec dégoût pour ses péchés qu’il a tourné sur lui-même dans la fureur et pendant un certain temps cherché une vie d’humiliation pour le Christ. Il fut jeté dans un asile et cruellement battu pendant des jours. Il était Jean d’Avila qui est venu d’absoudre et de libérer l’homme qui allait devenir Jean de Dieu.Élevé à la sainteté, le cœur de John tourné avec la compassion pour ses compatriotes dans les incarcère l’asile. Grâce à la connaissance d’un soldat de la médecine organisation et sur le terrain, il se mit à paître le sans-abri, les abandonnés, et les affligés de Grenade leur hébergement et le traitement de leurs blessures.Il a soutenu les orphelins, les étudiants, les prostituées et les chômeurs avec son propre travail, lui-même encombrer avec leurs dettes pécuniaires, souffrent souvent des accusations et calomnié par ceux qu’il a essayé d’aider.Après treize ans de cette manière, il est mort d’une pneumonie mort héroïque et sainte traitance en tentant de secourir un compagnon noyade. Il a été trouvé dans la mort, à genoux devant le crucifix, le visage collé aux pieds blessés du Christ.Saint Jean de Dieu a laissé au monde un petit groupe de cœurs vaillants. Les légendes de l’Ordre rapportent que souvent sur le bord de l’effondrement de Jean de Dieu a été relancé par les anges. Saint-Raphaël l’a accompagné dans ses tournées, de guérison et de transmettre la paix de Dieu dans le chaos. A ce jour, l’image du médecin angélique revêtu de l’habit de San Juan de Dios peut être trouvée dans ces hôpitaux. Murillo, sur sa toile au musée du Prado, représente Saint Jean de Dieu comme fragile, croulent sous le poids du malade, il est porteur, menacé par l’obscurité qui entoure. Le saint est accompagné par un archange puissant qui le fortifie, illuminant son visage et son chemin. Alors la jeune fille prit son (Frère Luis) Scapulaire dans ses mains. Elle se leva, soulevé le Scapulaire d’une manière très solennelle, comme si le présenter à quelqu’un. Elle baissa le Scapulaire et encore chuté brusquement à genoux. »De retour du Scapulaire au Frère Luis, Conchita a répété ce geste pour les scapulaires de Frère Juan et le Frère Miguel offrant chacun jusqu’à révérence. Avec un signe concluant de la Croix, l’extase a pris fin et Conchita revenue à la normale avec un sourire timide. Pour ce signe extérieur a été ajouté une grâce intérieure pour Frère Juan. « L’impression a été très grande. En particulier, j’ai été stupéfait et avec le sentiment intérieur beaucoup d’avoir péché tant de fois, et de ce fait j’ai imploré la miséricorde. Je n’ai jamais ressenti dans ma vie comme sentiment du surnaturel. Ensuite, comme les années ont passé … cette expérience a toujours été présent en moi. J’ai une grande confiance dans l’amour de la Vierge et une ferveur accentué pour Jésus dans le Saint Sacrement. Je crois que l’essence de la grâce donnée à nous, c’est notre propre persévérance dans l’ordre. « Frère Juan revint en 1966 après les apparitions avait pris fin. Il était curieux de savoir si quelque chose de semblable s’était passé. Conchita a confirmé « la seule chose que l’Ange avait embrassé avaient été nos scapulaires. »Cela conduit à s’interroger sur la signification profonde de cet écran de prédilection angélique et la solidarité. Conchita est très clair en affirmant que les frères eux-mêmes ont été agréables à God.Considering plus d’un millier des prêtres et des religieux ont participé à des apparitions et qu’il n’existe aucun autre document de la reconnaissance par Saint-Michel, la singularité de l’événement apparaît à prêter une importance particulière.Frère Juan Bosco, dans ses notes, a estimé cette réciprocité de la haute estime accordée à Saint-Raphaël dans leur communauté. Plus généralement, le geste a transmis un hommage pour le travail des frères qui dans leur ministère de la fréquentation et de la guérison et de leur amour pour les plus pauvres, le reflet le plus négligé et les infirmes les vertus des anges.Pourrait-il y avoir une explication plus loin? Le 19 Juillet 1936, par décret du gouvernement radicalement laïque, les Frères Hospitaliers de Saint Jean de Dieu ont été déclarés ennemis du peuple de l’Espagne. Quatre-vingt-huit frères ont été assassinés dans la Terreur Rouge. La persécution soviétique soutenu de l’Eglise catholique romaine exécutée 6830 deux religieux, des dizaines de milliers de tués fidèles laïcs in odium fidei, et profané et détruit plus de vingt mille lieux saints.Les fils de San Juan de Dios sont restés avec leurs patients, fidèles à la quatrième vœu de l’Ordre de ne jamais abandonner les malades, sauf dans la mort. Ils n’ont fait aucune tentative pour fuir la violence à venir.Soixante et onze frères martyrisés entre Juillet 24 et 14 Décembre, 1936 furent béatifiés par le bienheureux Jean-Paul II, y compris plus de quarante à Madrid et Barcelone, qui a refusé de quitter les hôpitaux et ont été abattus sur place. Certains exultaient à leur exécution, se félicitant les uns les autres à imminentes mots paradise.Their dernières étaient du pardon, pardonnant leurs meurtriers. Tous ont été constants.Pourriez-le martyre qui a précédé les apparitions par un quart de siècle ont eu une influence sur la survenue d’Août 6, 1962? Il est une idée merveilleuse à contempler. A cette époque, il n’existe aucune preuve reliant directement les deux. Peut-être dans les jours à venir ou à la résolution définitive de la Aviso et Grand Miracle cet événement extraordinaire peut-être plus complètement illuminé.Comme nous partageons les souvenirs des événements de cinquante ans nous devons honorer ce jour, digne de mémoire pour les dévots de Notre-Dame du Mont Carmel de Garabandal. Ce jour-là, le patron angélique de l’Église de Jésus-Christ qui est vénéré le Scapulaire de Saint Jean de Dieu à trois reprises. avec votre adresse postale complète, pays et code postal. Cet article a été publié le Lundi 6 août 2012 à 13:37 et est catégorisé sous I- Joey Lomangino. Vous pouvez suivre les réponses à cet article par le fil Flux des commentaires. Vous pouvez laisser un commentaire. Les trackbacks sont fermés.